Surgical Services: We are capable of performing a full range of soft tissue, orthopedic, emergency and diagnostic surgical procedures. 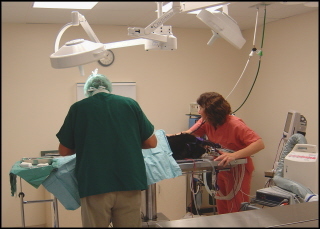 Procedures which frequire special training or equipment can be performed by a visiting board-certified veterinary surgeon at our hospital or referred to one of the specialty practices in the area. Anesthesia: We utilize the safest available anesthetics to provide an extra margin of safety, especially for our older or high-risk patients. Using the most modern equipment, the patient's blood pressure, heart rate, ECG, pulse oximetry and CO2 levels are monitored during all anesthetic procedures. The patient's body temperature is maintained throughout the procedure with thermal water and air blankets. 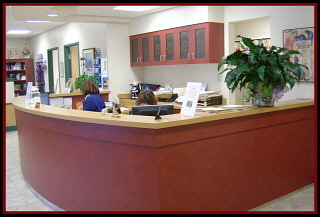 Radiology Services: There is an on site radiology suite for routine radiographs and special studies. We recently upgraded to digital imaging and we work closely with an expert team of radiology consultants. 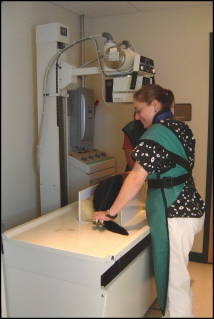 Our doctors and staff are trained to take radiographs for OFA certification. Additionally, several of the staff or certified in the PennHip radiographic studies (PennHip). Physical Rehabilitation Services: We offer a wide variety of conditioning and rehabilitation therapy including therapeutic exercise, neuromuscular electrical stimulation, transcutaneous electrical nerve stimulation, therapeutic ultrasound, strength training and more. Electrocardiography Services: We provide ECG and cardiac ultrasound services on-site as well as consultation referrals to cardiology specialists. Dentistry: Our dental services include oral charting, teeth cleaning and polishing, and extractions. We also offer the canine dental sealant OraVet(OraVet). Laboratory: Our in-house laboratory facilities provide for serum chemistry, hematology, serology, urinalysis and parasite testing. We also utilize commercial veterinary laboratories for specialized diagnostics and consultations. Our staff of Certified Animal Health Technicians are fully trained in laboratory procedures and undergo a periodic quality assurance-testing program to ensure accurate laboratory results. Permanent identification: We offer tattooing, and microchip identification (Avid Microchip). We can also complete the forms required to obtain a lifetime dog license using either of these as a permanent form of ID. Emergency Care: In the case of an after hours emergency, please contact Valley Central Emergency Hospital at 610-435-5588.